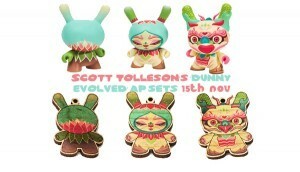 Scott Tolleson’s Evolved Artist Proof Dunny sets release 15th Nov! In the artist proof set you get treated to charms that are 1.5” tall, printed on maple wood finished with gloss overlay and hyper print details for each version of his Evolved designs. You get all three matching the Dunnys. Only 15 Sets are available.